A group of three passengers, traveling in a train cabin that evokes the image of sweltering afternoon heat, are heading to an unknown city that is caught preparing for an impending war. A sickly translator, Esther, her sister Anna, a curvaceous woman preoccupied with corporal ambitions, and Anna's son Johan, an embodiment of purity. Suffering from a respiratory condition, Esther checks into a hotel room, while Anna and Johan occupying the adjacent suite. Soon, Esther's excessive attachment proves too suffocating for the sensual Anna, who walks out for a nightly adventure. The bedridden Esther overindulges herself with tobacco and alcohol in a vain attempt to subdue her loneliness. Johan is left to his own "strangeland" where he wanders through the near deserted hotel, encountering an elderly kindhearted hotel manager, and a band of dwarfs from a circus company. Johan who initially keeps a respectable distant from his ailing aunt gradually develops an empathy for her, drawn together by their mutual love for Anna and sense of solitude. On the final day of return, still unable to travel, Esther hands over Johan a letter containing a list of translations of foreign words for their journey. Anna and Johan leave behind ailing Esther in the desolate hotel and take a train homebound. The Silence is Bergman's last installment in his "God" trilogy, and arguably the most metaphysical and agnostic film of the trilogy. As Through A Glass Darkly equated human holiness with god, Winter Light analyzed spiritual bankruptcy, The Silence is an examination of emotional isolation in a world devoid of any God - where redemption lies in human connectedness the lack of which leads to wretched conditions. Allegorically, Esther has intelligent faculties at her disposal to communicate, but physical deficiency, fear of rejection by dear ones, and a sense of supremacy prevent her from being understood. Anna, on the other hand, perceives physical contact as a substitute for emotional intimacy, realizes the limitations of her understanding of communication, and is ultimately drawn to a state of emotional isolation. Johan's immature absorption of Esther and Anna's ideas leads him to tilt towards Esther, apparently. 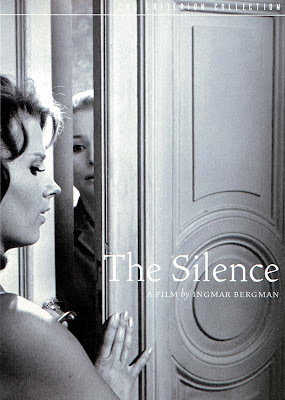 Bergman conveys alienation through spatial disconnectedness, partitioning physical space, darkness, sharp light angles, and scarcity of words. 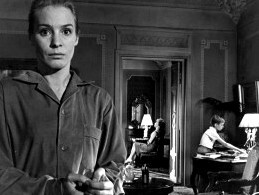 The use of mirrors creates a sense of distance between characters and the images in the mirrors further accentuate a sense of emptiness in characters. Note the scene that shows Esther observing Anna's reflection from the adjoining room as she washes her face, suggesting the ruptured intimacy between them. After a prolonged, asthma attack, Esther beseeches God to allow her to die in her own land. In the end, she is left behind by Anna and Johan to die in an abandoned hotel room in a strange land, Alone and forsaken:silenced by a conspicuous absence of God.